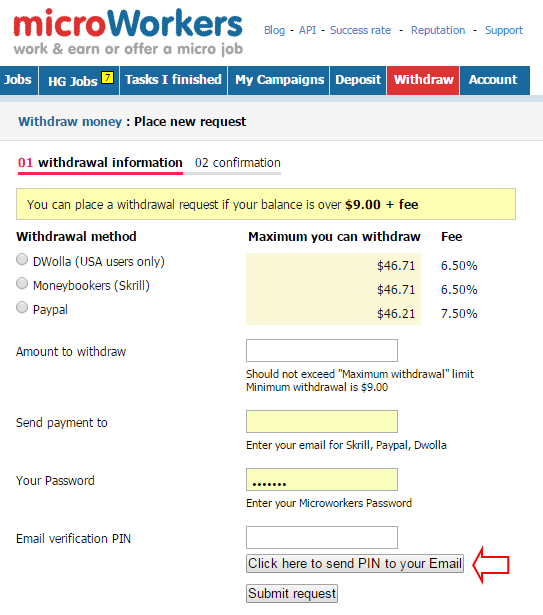 The minimum amount required to submit a withdrawal request is $9.00 plus fees, depending on your payment option (6,5% Skrill/DWolla and 7,5% Paypal). Everyone needs a PIN in order to activate one’s withdrawals. 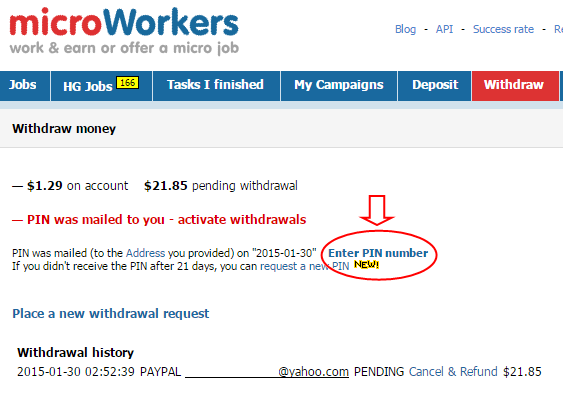 Your PIN is mailed to your home/mailing address after placing your first withdrawal request. This is an automated process. Whilst not many are very happy about this process, it is Microworkers’ way of ensuring its Workers’ identities and maintain genuine Workers in the platform. Note that the very reason why PIN is mailed to one’s mailing address is to ensure that all Workers are verified and multiple accounts are prevented. 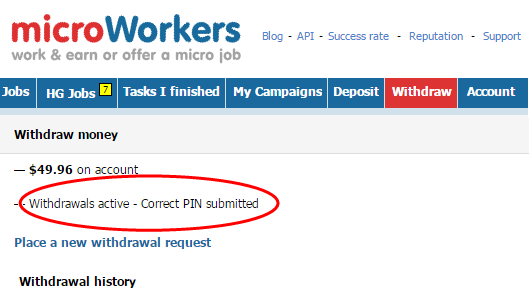 Once the PIN is mailed, such status will be displayed in your account and a link will appear on your page where you may enter your PIN once it is received. After such is completed, your withdrawals will be activated. Note that this process is only performed for the first withdrawal request and will no longer be repeated once your withdrawals are activated. As PIN delivery can take between 1-4 weeks (depending on your mailing service and location), you have to make sure you have entered your correct mailing address before placing your withdrawal request. This option can be updated form your accounts page. If you have previously updated your address and would want to add changes on this section, you may open a Support ticket and request that your address field be reset. An option to request a new PIN for a $2 fee is available if such is not received. So all is great, and you have activated your withdrawals. Succeeding earnings will no longer require the PIN sent to your home address. 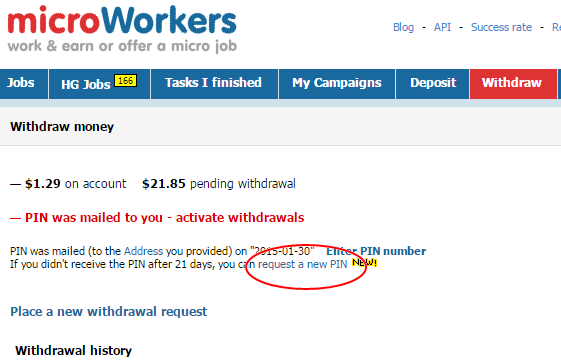 Instead, a PIN is mailed to your Login email address upon withdrawal request. This is a newly added security measure to ensure the request is made by the genuine account holder. Please check your email to obtain the withdrawal PIN and complete your request. 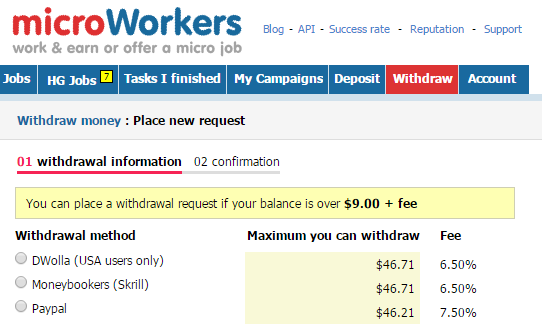 Microworkers send out payments twice a week (Sunday and Wednesday). Got more questions on withdrawals and PINs, send a Support Ticket. How Many Days Wait Address Verification Letter. will it be possible to use NETELLER as they give much better options for people who cant use paypal? 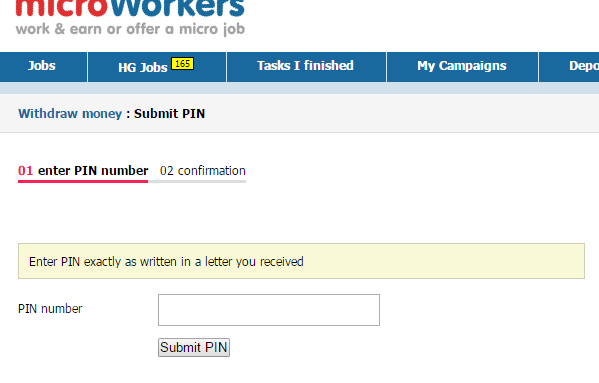 Please microworkers.com kindly bring in another payment processors, so we Africans including those in Nigeria can withdraw their funds since your three payment processors don’t accept Nigerians and other African countries. We are working but we can’t collect our funds, I would suggest you consider bringing NETELLER or PAYZA. Please you guys should help us. Thank you, I received my PIN direct to my address at Malaysia, i wait for one month to get the pin, sent out 03/07 and get it exact by 03/08.. iam really happy.. now waitting for my earning to sent it to my account skrill .